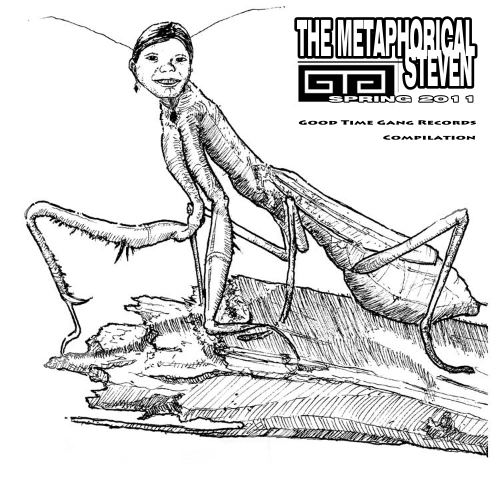 Head over to the new GTG bandcamp page to download The Metaphorical Steven, a new 15 song compilation from GTG Records. This compilation is available for free (although donations are welcome) and features a window into where GTG is at in the first half of 2011. All of the songs on this compilation were released in the last 12 months, with 5 of the songs currently being unavailable anywhere else. An early look into new releases from The Plurals, Small Houses, Josh David and the Dream Jeans, The Break-Ups, and middleman can be heard, as well as a live recording of a new song from our friends in Calliope, and highlights from the recent excellent output of Frank and Earnest, The Hat Madder, Narc Out the Reds, Honah Lee (new album on GTG in June! ), Drinking Mercury, Jason Alarm, Fade to Black, CrookedSound,and Stargrazer round out the set. Download away and enjoy! The compilation was sequenced by The Plurals while on tour, and our friend Dave Dunn in Denver, CO whipped together the artwork (and coined the title) while hanging out in Denver. In every way, this compilation is a snapshot of this particular moment in time, and we hope everyone enjoys it.